Disclosure (which I feel, given the post’s content, should be reiterated): I am not short even a single equity of any kind. I am only long selected stocks and cash at this time, but surely subject to a change of status in the future. 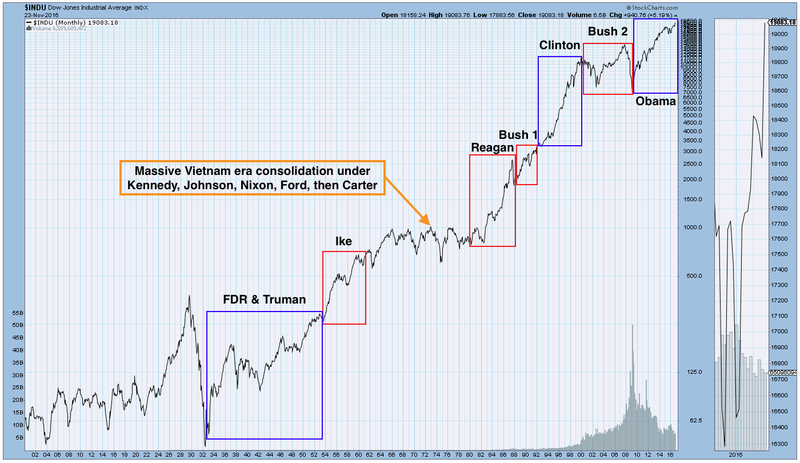 Why, did you know that in a note to clients Tom Lee wrote that Donald Trump’s term could usher in major bull market akin to those preceded by Ike and Reagan? He did, in a note to clients and the MSM really wants you to know about it! Now, there is a case that eventually his favored areas of Energy, Mining, Basic Materials, etc. will out perform. But that word “eventually” is an important one, unless you are a died in the wool trickle downer willing to ride the big correction or bear market that is likely first. “Notably, the two longest bull markets in history 1953-1974 and 1982-1999 were preceded by a Republican ‘revolution,’” he wrote. Okay fine, can’t argue with history, can we? So let’s review some. There is a supposed republican revolution taking place. Fine, I get that. The people are tired of being taxed and inflated to death. Well, the first thing at least, looks to improve but much more so for the richest Americans. The little guy hoisted Trump on his tired shoulders and in time, may see that he screwed himself again… unless of course the bounty trickles down this time. Under both parties, the rich get… anyone? The poor and/or middle class get… Bueller? And now let’s consider Mr. Lee’s assertion that the two longest bull markets in history were preceded by Ike and Reagan. 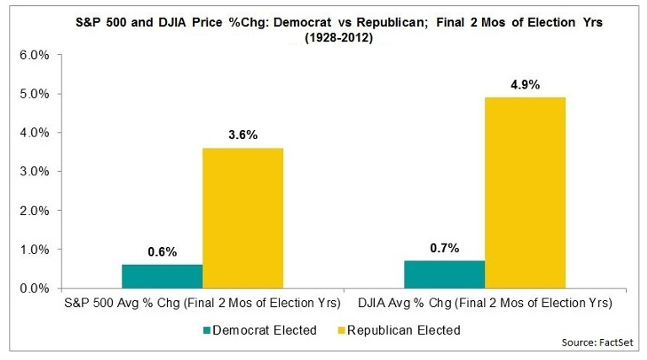 The majority of the bull market out of the bottom of the Great Depression was under democrats FDR and Truman. Ike’s presidency caught the blow off stage and led to a massive consolidation spanning multiple presidents and both parties. Who presided over the great crash of ’29? Republican Herbert Hoover. Whose term presided over the fomenting bubble that created the crash? Why, that would be one Calvin Coolidge, a… you guessed it, republican. The article’s assertion about a supposed post-Ike bull market is wrong. Period. And just where did he get “1953 to 1974” from? The bull ended in 1966. Do people just make this stuff up secure in the thought that the sheep they feed are not going to back check? 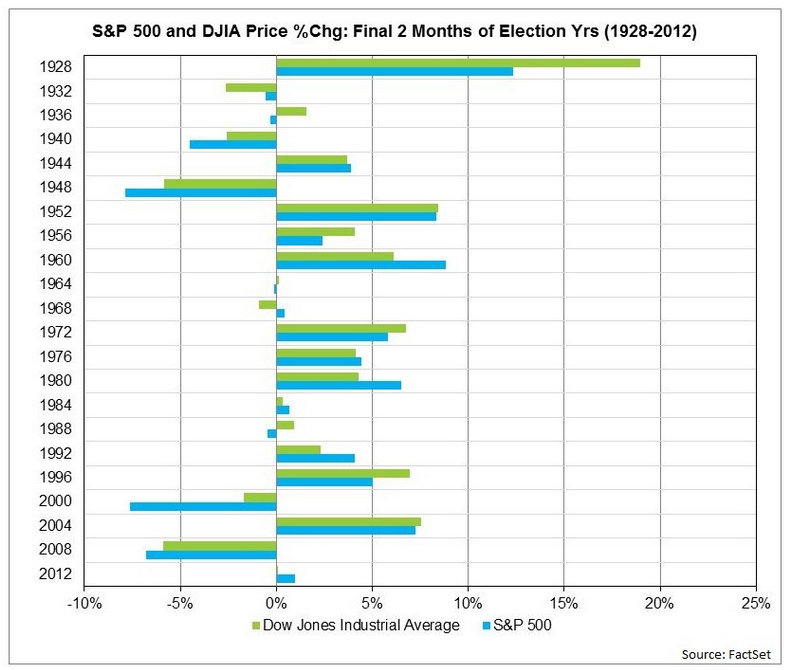 So going by the above data [which looked at recent history], a Trump victory would be the market-bearish course. A Clinton victory would probably see major support hold in US markets. Or would it? 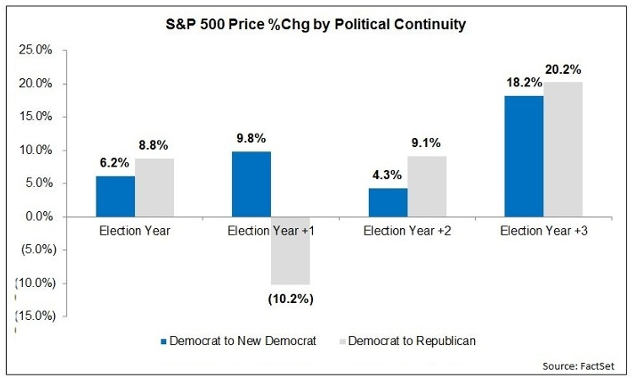 A breakdown of nearly a century’s worth of data shows that the market finishes out election years better under an elected Republican than Democrat. Fair enough. All seems right with history in this small, post-election time frame and per our analysis we did not take the MSM’s pre-election bait as a would-be Trump presidency was being promoted as bearish, far and wide. 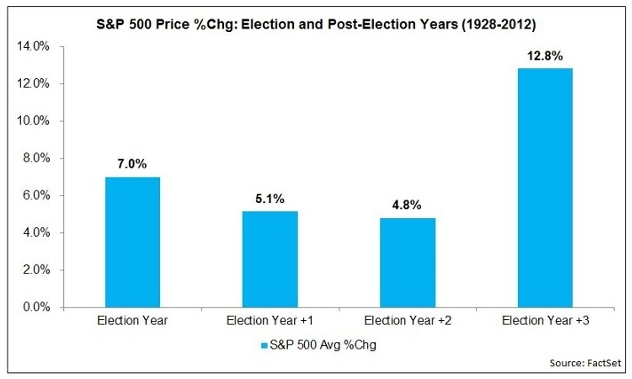 Indeed, the market is simply rising to put in another year of gains as it usually does per all years of the presidential cycle. That factors the market’s long-term upward trend (why else would anyone even participate?) but there have been notable exceptions. In the post-2000 Greenspan ? Bernanke ? Yellen era of Inflation onDemand alone, we have had a 2-term democrat hand off to a republican and a 2-term republican hand off to a democrat that have coincided with market disasters. That is in a span of 16 years after a 50 year period of relative calm. So today we have a 2-term democrat handing the ball to a republican, as in 2000; a time that has so many parallels to today. Here is a breakdown of Democrat to Democrat and Democrat to Republican hand offs. Election year seems fine (again, if we ignore 2000 and 2008, which we of course won’t). But what is up with Demo to Repub in Year 1? This generalized data has an anomaly that is well worth our attention. The above are facts of history showing that misperceptions are being promoted in the media. We have a handy new buzz phrase, the S.O.D. or Sons of Druckenmiller, to label those who are following Druck’s ‘I sold gold and bought the stock market the millisecond Trump was elected’ hype and their own political bias right into a contrary setup. In the S.O.D. post linked above I tried to show how political views vs. market dynamics and the ramping sentiment of the ‘little guy’ (including many Trump voters) are setting up some pain to come. This post adds more context after I saw one too many idiotic MSM articles on the same theme. So I thought I would juxtapose some reality against the promotions. You are free people. You can have whatever political bias you want. But these are the markets and there is no ‘Team America’ or political revolution where the markets are concerned. There is only the taking of money away from sheep, and then the taking of their wool and finally, sitting down for a nice rack of lamb, with all the side fixin’s. Maybe I am wrong and over stating the danger. But my job is to tell it like I see it and contrarian boxes are being ticked left and right (no pun intended). I remain only long the US stock market, but this is being managed on a week to week basis, and only with a view to year-end for now. The next big move is likely to come about when all the dumb MSM articles lure in all the naive players, including Ma and Pa, who just cannot separate inner beliefs from market management. I know I sound like a know-it-all. But I was once a naive player. I learned my greatest lessons in 2000-2002 when half our funds were lost under the ‘advice’ of others. I took over our personal fund management in 2002 and have never looked back. Wall Street’s financial media are on an epic promotion right now. It may or may not be difficult to pinpoint its termination point, but terminate it will. We are not in a grand new economic era in America; at least not yet.